I bought the hubster and I some sherbert treats to try the other day. I had never seen this brand before (Gooble) and figured they’d be fun to try especially since they were on sale – 2/$3! Interesting packaging no? Very eye catching if you ask me. 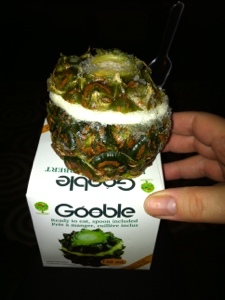 Check it out…its a scoop of pineapple sherbert, served in a hallowed out mini pineapple. 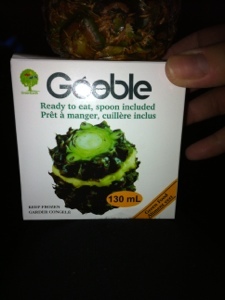 It even comes with a tiny plastic spoon so it literally is an all in one packaged product. See! How cute is that!? I’ll admit, it was mighty tasty. Too tasty in fact – hence the empty bowl. 😉 I found the portion to be just right size as well and both the hubster and I prefered the pineapple flavour over the orange, which I had chosen for him. Of course it came in a hallowed out orange! Anyone else every try sherbert like this? Nothing wasted this week – Hooray!! 🙂 Believe me, there are a few shady looking items in the fridge but I did check on them. They’re still OK so they will definitely get used up this weekend! So what I have being doing is decanting the products from their original bottles into smaller clear bottles/bottles stripped of labels. I must admit that I do love the uniform and streamlined appearance as well as the fact that its easier to see if you’re running low on something. Personally, I love the pump bottles (from Bath & Body Works). I find they dispense enough product for you to use within one to two pumps which also helps you save in the long run because you’re literally not dumping product straight down the drain. 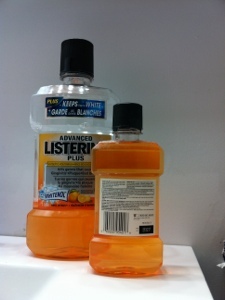 Mouthwash decanted into a smaller bottle. Conveniently fits easier in the medicine cabinet. I also do this with other items as well that are not shown here: shampoo & conditioner, laundry detergent, dish soap and lotion. Buying in larger containers or in bulk and decanting totally saves more in the long run as well. I often find the larger sized bottles of body wash, mouthwash and hand soap are more cost effective in terms of cost per unit vs the smaller single serve sizes especially more so when they go on sale and there’s coupons available. How could I possibly pass up buying a larger size of something that is needed and will used when it costs significantly less then a convenient single serve size? It also reduces waste as you are refilling the dispenser you already have and recycling one refill bottle. So tell me, do you feel like you’re being overrun with subliminal advertising on packaging? Do you decant your products? Sorry late post – no waste here this week! I refused to buy peppers unless absolutely needed because I was afraid to waste them again. My logic saved me this week! Anyone else here drink ‘green smoothies’? I’ve been hearing about them a lot recently especially since New Year’s just passed. I was very hesitant about adding raw spinach to my fruit smoothie but from what I read online, you don’t really taste it. Key phrase ‘don’t REALLY taste it’. I chose to drink this 1 hr before putting food into my body so the maximum nutrient absorbing action could take place. Plus it was kinda nice getting to eat a two part breakfast 😉 Overall, there was no ‘feeling of betterness’ or ‘more energy’ as some have claimed but because it’s a fibre filled smoothie vs juice that could be the main reason. And the taste factor – you get the essence of a veggie but you really don’t taste anything IF you include enough tasty fruit options. The darling hubster was appalled at the sight of my smoothies and refuses to taste them BUT they truly are tasty. I don’t make one every day for breakfast – something about having too much spinach and your body adjusting to it and some other negative benefit – but on the days I do, it sure is tasty and a super easy way to ensure I meet my fruit & veggie quota for the day. Do you do the green smoothie thing? What are your fave combo’s? Just wanted to wish everyone a safe, happy & prosperous New Year! 2013 is year of the Snake. We’re having a huge blizzard/snow day. A lot of businesses are closed or will be opening late/closing early. To prep for this storm – Nemo – dad and I actually went and purchased a few extra grocery items yesterday as well as special grocery items for Chinese New Year’s which takes place this weekend. 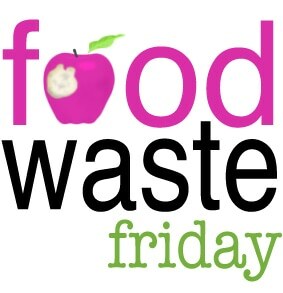 I’m hoping to get creative with leftovers so we have no waste next Friday. How’d you do? And are you experiencing this ‘Nemo’ as well? There’s something to be said about finding a bargain on banana’s. I know in the US, the store Trader Joe’s sells 5/$1 or a pound for a buck. Here the prices range anywhere from $0.49/lb right up to $0.89/lb and even higher for organic. Much to my delight, I spotted the clerk filling up the discount, dent & ding rack so I scooted on over to see what she was putting out. This mammoth bag of banana’s. I weighed the bag when I got home and counted over 20 banana’s …. for $1.69. That’s right – the entire bag was only $1.69! BTW – The bag weighed 12lb’s. The best part, 90% of them were still firm, green and just starting to go yellow. I’m guessing a new shipment of banana’s came in and there were only so little left from the old that they decided to put it out for clearance? I have no problems with that if that means I can snag such a deal! After a week, they started turning as we can only eat so many banana’s in a day. 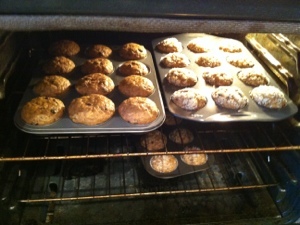 I mashed the remaining and froze some and used the rest to make up some wonderful muffins! These baby freeze great as well. 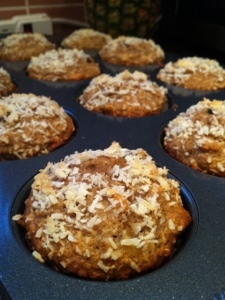 Walnut, coconut, choc chip banana muffins. 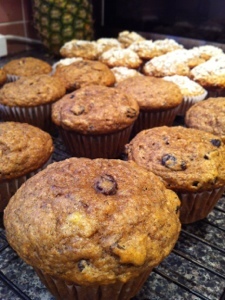 Plain old raisin & banana muffins. Snack time! Nothing like a freshly baked muffin still warm from the oven paired with a nice cold glass of milk. Hey…don’t judge! Someone had to be sacrificial lamb and do a taste test. May as well enjoy myself! 😉 Don’tchas just love great bargains? 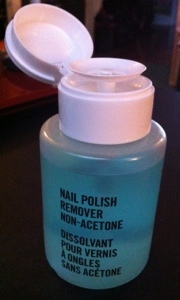 While out at the discount grocery store I happened to stumble upon this lil gem – Joe Fresh Nail Polish Remover. I had been looking for something similar as I’ve only seen this sort of dispenser being used at the nail salons. I’ve been brainstorming on how to make my own via DIY and though I had seen something similar at Sephora, I couldn’t justify the price. I even thought about buying those brown bottles for rubbing alcohol that you find in doctors offices. 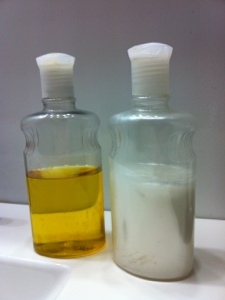 Do you have a nail polish remover dispenser like this or are you a traditionalist that prefers using the bottle? Unfortunately, I lost a yellow pepper this week. When I went to reach for it, my hand went right through it. E to the capital W!! So I checked the rest of the peppers and all were well. Just the one bugger decided to turn on me.